I forgot to take a picture today. But as yesterday was so lovely, and I happened to take a panoramic shot of the beach at Surfer’s Paradise, I thought now was a good time to see how WordPress copes with me entering a picture of that style. 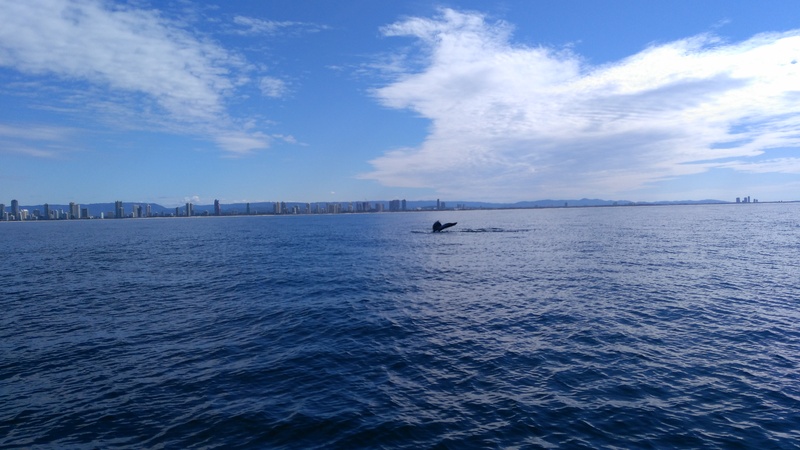 An absolutely brilliant day out on a boat (coming from someone who easily gets sea sick), out from Surfers Paradise on a Whale watching tour. They guaranteed whale sightings….and didn’t fall short. This little fella (apparently a teenager) stayed with our boat for over an hour, coming up every few minutes or so. Originally I wasn’t taking any pictures, as I just wanted to savour the reality of it, but after a while, I knew spending a little time behind a screen wouldn’t take away from the event. This is my favourite, as it not only shows his tail rather than a hump of his back, but also the stillness of the Pacific ocean, and the high rises of Surfer’s in the background.